I had the opportunity to dine at Tiffany’s over the summer, and I absolutely loved it. (See my review here –> Blue Box Cafe). I felt like I was dining in a giant Tiffany blue box (hence the name of the cafe is the Blue Box Cafe) and I thought the food was very good. I enjoyed chilled pea soup and a lobster and grapefruit wedge salad. However, as stated above, it was not the easiest of tables to land. Instead of having to fight the reservation system again, I decided to recreate my meal once I got back home to Florida. 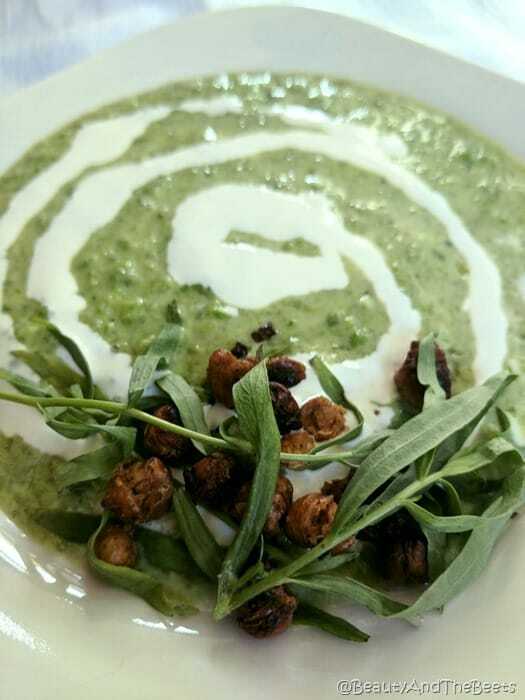 The Chilled Pea Soup is perfect as the weather begins to transition from Summer to Fall. Now the soup at the Blue Box Cafe was served with mint and applewood smoked bacon, but since Mr. Beet does not eat bacon, I left it out of my recipe and instead added Alderwood Smoked Chickpeas. Personally, I like the chickpeas better, but feel free to use smoked bacon instead. 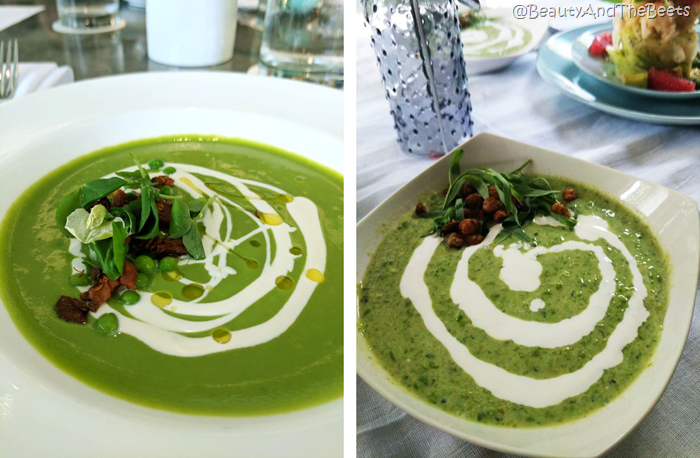 Chilled Pea Soup from Blue Box Cafe on the left. On the right: the author’s homemade recreation. Now I am inspired to paint my house in Tiffany Blue and sit in Tiffany blue chairs around my Tiffany blue tableware. I hope you enjoy the soup and here is the recipe for the Lobster Grapefruit Salad with Poppy Seed Dressing. 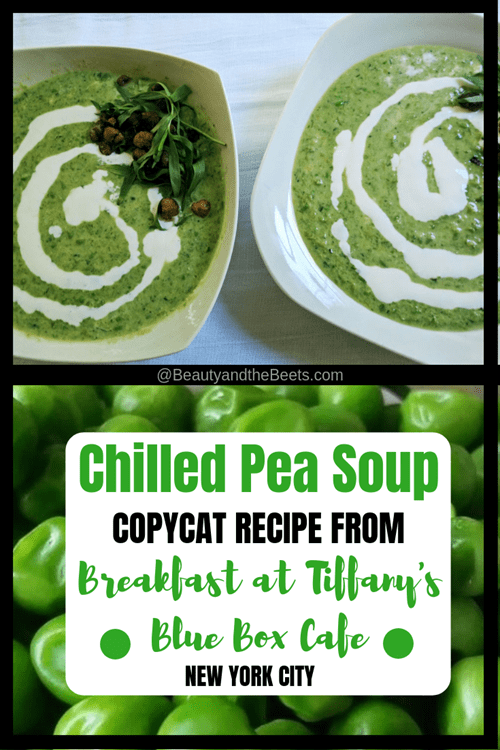 The recipe is based off the Chilled Pea Soup from the menu at Blue Box Cafe (aka Breakfast at Tiffany's) in New York City. Melt the butter in a large saucepan or small stockpot over medium heat. Add the chopped leeks, cook for about 7 minutes until tender, stirring occasionally. Carefully add the vegetable broth. Increase heat to high and bring the soup to a boil. Add the frozen peas then let the soup stay over high heat for 3-4 minutes, until the peas are tender. 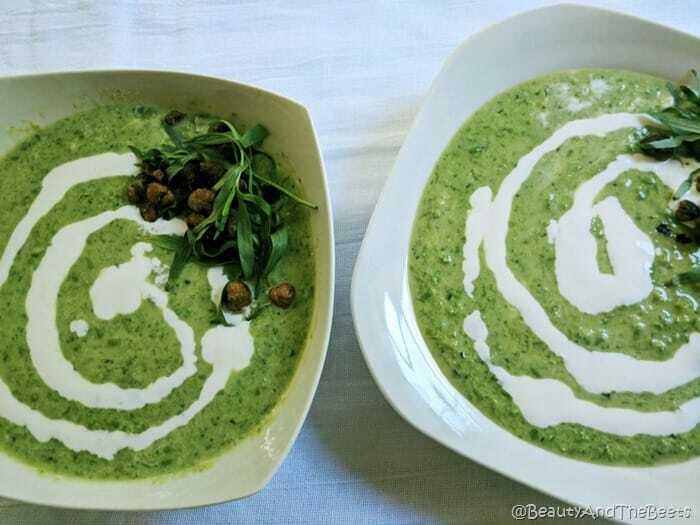 Remove the soup from the heat and add the mint and yogurt. Working in batches, puree the soup in a blender until the mix is smooth. Chill the soup in a large bowl or stockpot for a minimum of 2 hours. 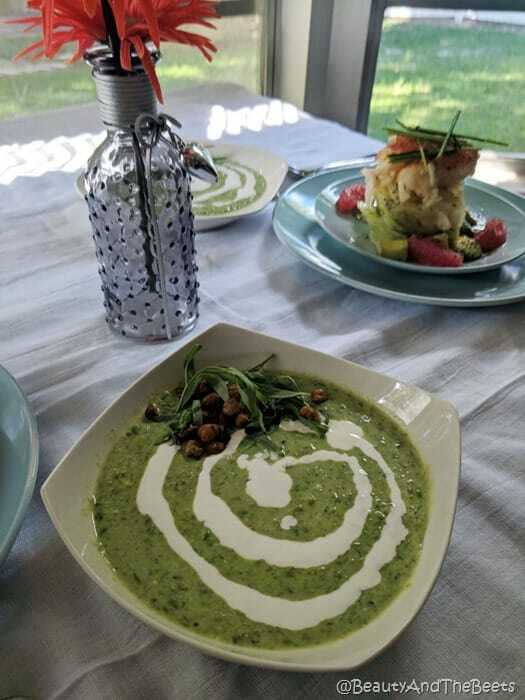 Just before serving, swirl a drizzle of the creme fraiche over the soup and garnish with tarragon leaves and the smoked salt chickpeas.